The climate and the enviroment of our village, leads to high quality local products like extra virgin olive oil and tomatoes. In the area of Platanos – Falassarna there are around 160,000 Olive Trees of the Koroneiki Variety. 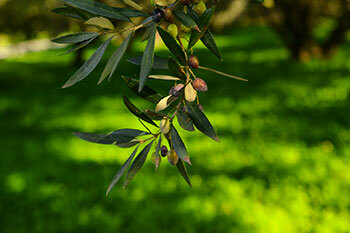 One could say that the cultivation and the harvesting of the Olive tree is a tradition in the area. It has been a part of the culture and lifes of the residents for so many years that we are unable to say when this relationship began. The protection of the Olive Tree is done in cooperation with the Olive Protection Fund and the Institute Of The Subtropical Plants and Olives. Harvesting the fruit is done using electrical olive harvesting rods over the tree. It usually begins at the end of October and by the end of January almost all of the trees have been harvested. There are two cooperative Olive Mills operating in the area which are modern and have a high capacity. The processing of the fruit is quick, immediately after harvesting at low temperatures and the olive oil is stored in stainless steel tanks. The Olive Mills operate in accordance with the new legal and markets requirements and the people’s age-old love for olive oil. The area’s climate is special, arid with very little rainfall, permanent existence of wind and mildness given by the presence of the sea. The combination of the environment, climate, variety of olives, and the people’s knowledge and actions lead to the production of almost exclusive Extra Virgin Olive Oil (EVOO) which means low acidity oil without descruction of flavour and aroma. The Extra Virgin Olive Oil which is produced in Platanos-Falassarna has a medium-intensity fruitiness and has been awarded the MARIO SOLINAS quality award of the International Olive Oil Agency in 2004. Specifically, the Oil of the Agricultural Cooperative of Platanos took fourth place worldwide and came first among the Greek participates in the category “medium-intensity fruitiness” in 2004 in Spain. 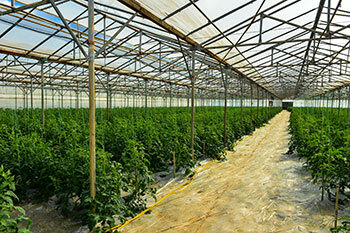 The excellent climate all year round without major fluctuations in temperatures was the main reason for the building of greenhouses in the area of Falassarna during the 60’s. In the beginning they were simple wooden constructions whereas now they are modern metal constructions, with modern technological equipment and cover a total area of 1000 acres. The vegetables produced, mainly tomatoes and cucumbers, have excellent organoleptic characteristics which are due to the soil, climate conditions of the region and the great expertise of the producers. The produced vegetables are certified with the integrated management system Agro 1,2 and 1,3 GLOPAL GAP, enabling their trading across Europe.